Jesse Holley is an American football wide receiver for the Dallas Cowboys of the National Football League. He was signed by the Cincinnati Bengals as an undrafted free agent in 2007. Jesse Holley was awarded the 80th and final spot on the 2009 Dallas Cowboys training camp roster after finishing as the winning contestant on former Cowboy Michael Irvin’s national broadcast reality television show, 4th and Long, that aired for 10 episodes during the spring of 2009. Holley displayed flashes of his athletic ability through the preseason to earn a spot on Dallas’ practice squad where he spent the entire season. He originally entered the NFL as an undrafted free agent in 2007 with the Cincinnati Bengals where he spent the first month of the season on the team’s practice squad. # Earned a spot on Dallas’ training camp roster after winning Michael Irvin’s reality television show 4th and Long and finished the preseason with three catches for 19 yards and one punt return for an 82-yard touchdown. 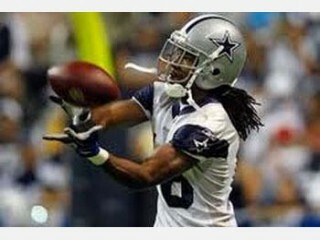 # Was released at the end of camp but immediately signed to Dallas’ practice squad where he spent the entire season. # Signed with the Bengals as an undrafted free agent on May 2 and went to training camp with the team before being released during final cuts. # Finished the preseason with three receptions for 25 yards. # Signed with Cincinnati’s practice squad on Sept. 7 but was released on Oct. 4. # Placed eighth in Tar Heel history in career receptions (126) and receiving yards (1,760), averaging 14.0 yards per-catch and scoring seven touchdowns. # Versatile athlete who also played two seasons as a walk-on guard with the elite UNC basketball team before deciding to play only football after his sophomore season. # On the hardcourt, scored 11 points in 15 games as a freshman in 2003-04, and scored 13 points in 10 games as a sophomore member of the 2005 National Championship team. # As a senior, caught 37 passes for 466 yards and two touchdowns, and ran his streak of consecutive games with a catch to 30, which was the longest active streak in the Atlantic Coast Conference. # Had career-highs of 47 catches and 670 yards as a junior, earning an honorable mention All-ACC nod. # As a sophomore, his 45-yard touchdown catch with 0:36 to play produced a 31-24 win over Wake Forest. # Attended Abraham Clark High School in Roselle, N.J., where he earned top-20 national wide receiver prospect ratings while setting career records for catches (106), yards (1,449) and touchdown catches (27). # Earned a degree in communications from UNC. # 2009 Dallas Cowboys Early Thanksgiving Day Meal at The Salvation Army. # Annual team Holiday Hospital Visits. # Salvation Army Angel Tree Christmas Program. # Annual Dallas Cowboys Kickoff Luncheon and Cowboys Family Cookbook benefitting Happy Hill Farm. # Make-A-Wish Foundation of North Texas. View the full website biography of Jesse Holley.